Blessed Angeline was born into Royalty at Umbria, Italy; her father being Count Angioballi of Corborra. Tragedy struck her early life when her mother died and two years later her husband, the Count of Civitella del Tronto. Blessed Angeline was left a childless widow and although she inherited great wealth, it didn’t secure her happiness. Bl. Angeline dedicated her life to God and devoted her services to the care of the needy whilst preaching a message of repentance. Soon she had many supporters and helpers. 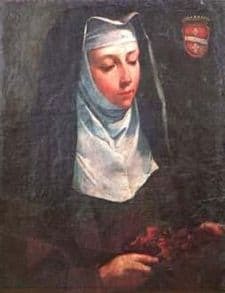 On a visit to Assisi, she had a vision in the Cathedral of Santa Maria which encouraged her to continue her work helping both the physically and spiritually poor. Bl. Angeline founded a congregation of Franciscan Sisters and a congregation of Lay Sisters. She settled in Folingno at the monastery of St Anna. Her communities evangelising work excelled giving rise to the formation of similar communities in other cities across Italy. Bl. Angeline’s Feast Day is the 13th July. Pray for us that we will give generously to those who hunger for food and the word of God.